Exploration Flight Test-1, or EFT-1, for the NASA Orion multipurpose crew vehicle is targeted for a September 2014 liftoff. The unpiloted Orion will travel high above the Earth’s surface, and then return to Earth in a high-speed re-entry. This test will evaluate several of the most significant aspects of a deep space mission and re-entry, a precursor to Orion’s first human-rated flight. SAN DIEGO, Calif. — NASA is gearing up for the inaugural flight of its next manned spacecraft, which is now less than a year away. NASA's Orion capsule is slated to launch atop a Delta IV Heavy rocket from Florida's Cape Canaveral Air Force Station in September 2014. The unpiloted mission, known as Exploration Flight Test-1 (EFT-1), features a high-altitude, high-speed plunge into Earth’s atmosphere to assess the craft’s heat shield and ends with a parachute-aided splashdown into the Pacific Ocean. SPACE.com sat down last month with Price at the American Institute of Aeronautics and Astronautics (AIAA) SPACE 2013 conference here to discuss Orion’s upcoming maiden voyage. 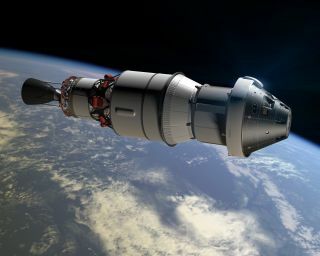 Despite the early description of Orion as "Apollo on steroids," it's clear that the 21st-century spacecraft is not simply a retread of the capsule that took astronauts to the moon in the late 1960s and early 1970s. NASA's Orion deep-space capsule is slated to be the go-to spacecraft for missions to an asteroid and beyond. See how NASA's Orion spacecraft will work in this Space.com infographic. "Apollo on steroids is challenging. It sure looks like it because of its shape," Price said. That shape was chosen, he added, because it minimized the risk associated with Orion's aerothermal environment, the heating induced by the very high speeds of re-entry. For one, Orion's computer systems and the built-in redundancy are far different than they were on spacecraft 50 years ago, Price said. "We've got a million lines of software code. And when we go to the moon, we’ll have another million." The Orion spacecraft is imbued with autonomy, failure detection systems and the ability to reroute things — say, a balky thruster that's automatically rebalanced by redundant thrusters, Price said. "It's a lot more complexity," Price said, "so that it can be safer and more reliable. It makes for an amazing machine." Technicians at Textron in Wilmington, Mass., apply Avcoat ablative material to the composite honeycomb structure attached to the Orion heat shield carrier structure. The upcoming EFT-1 — which will take Orion about 3,600 miles (6,000 kilometers) away from Earth — is focused primarily on checking a dozen or so issues. Evaluating Orion's heat shield is "a big one," Price said. "We haven't returned at this speed since Apollo, and it's faster than [the space] shuttle came back." That heat shield needs to withstand a true trial by fire — the 20,000-mph (32,000 km/h) plunge through Earth's atmosphere. Orion's heat shield incorporates a different formulation of Apollo-era "Avcoat," a material designed to ablate as it heats up to safeguard the inside of the spacecraft from the severe temperatures of re-entry. Avcoat ablator material fills up some 330,000 cells of a honeycomb matrix that constitutes the heat shield. Price said that Avcoat's provider, Textron Defense Systems in Wilmington, Mass., is fabricating Orion’s heat shield — the world's largest, measuring some 17 feet (5.2 meters) in diameter. "They haven't made Avcoat for 40 years," Price said, adding that NASA convinced the company to restart production of the material. Another challenge faced in the Orion program was building the electrical systems, including the computers and processors, Price said. "We’re going through the Van Allen radiation belts. So we've done a lot of testing to assure they survive the radiation environments," he said. "We aggressively tried to put as much as we could on this first flight. But as funding was reduced ... we moved some things around. Most of the crew systems that we don't need for this flight, we deferred until the 2017 flight." The politics of space meets Orion. Ted Cruz, Republican senator for Texas, visited Orion at the Johnson Space Center earlier this year. Orion program manager Mark Geyer (left) discusses the inner workings of Orion with the senator. Also an unpiloted mission, that 2017 flight would fling Orion on a circumlunar trajectory — with details still being evaluated — using NASA's Space Launch System mega-rocket, which is also in development. Early Orion missions will be lighter than later flights, similar to what was experienced in building and flying the space shuttle fleet, Price said. Next year's EFT-1 flight should be a booster shot in the arm for NASA's deep-space mission plans, he added. "Building Orion is building a capability," Price said. "As science and politics drive us in a different direction, we can do different things with the same system. We can use this system with kit modifications to do the durations we need. It’s a tool beyond Apollo that was a point design to go to the moon." Over the next several months, the march toward Exploration Flight Test-1 is loaded with calendar milestones to ready Orion, Price said. "And then we're on the range in September. We've got the range date. There's a lot of exciting things going on," he said. The recent government shutdown, which forced NASA to stop most work from Oct. 1 through Oct. 16, should not alter the timeline for EFT-1, Lockheed Martin officials said. During the shutdown, all Orion contractor personnel located at NASA centers were redirected to alternate work locations so they could continue making progress on the Orion spacecraft, Allison Rakes, a spokeswoman for Lockheed Martin Space Systems, told SPACE.com via email on Oct 7. Orion's heat shield is continuing final assembly at Textron Defense Systems in Massachusetts, and fairings are being tested at Lockheed Martin in Sunnyvale, Calif. In addition, the attitude control system is being tested at Aerojet in Sacramento, Calif., and the Delta launch system is being assembled at United Launch Alliance’s facility in Decatur, Ala.
"Right now, we do not anticipate an impact to the EFT-1 launch date," Rakes told SPACE.com.